County Shores has a large harbor and docking area. By water we are located approximately 1.5km West of Telegraph Island and directly South of the Canadian Coast Guard Buoy Q42. We accommodate most power boats up to approximately 28ft. We have over 1500ft of docking space and operate our docks on a first come first choice basis. There is always plenty of room even on the busiest of weekends. Docking and launching fees are separate from camping and accommodation fees (unless included as part of a package). 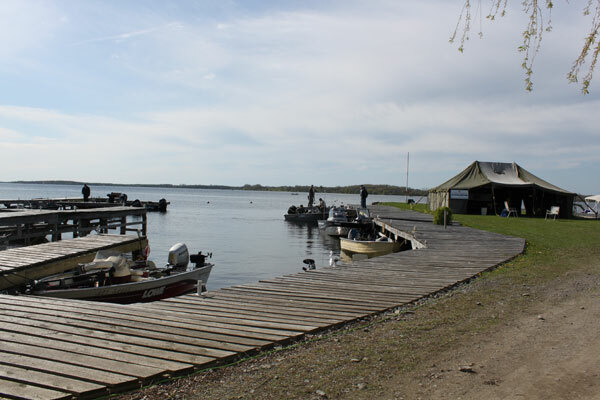 Boaters and anglers that are not staying at County Shores are also welcome to come use the docks to launch their boat and use our facilities on a docking/launching day use pass, see our Rates and Packages page for details. There are two main launches at County Shores and a third launch that is used for roof top boats, kayaks and canoes. With three launches there is never a fear of long line-ups to get your boat in or out of the water. Boaters and anglers are welcome to launch their own boat with their own vehicle at County Shores. If for some reason you need County Shores to launch your boat (i.e. hooked to a large R.V or maybe a small car) we are more than happy to do this with our own tow vehicle at no additional charge. 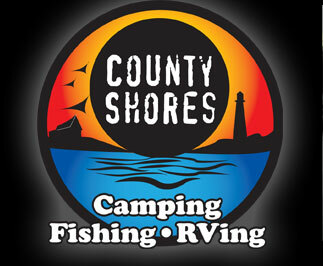 County Shores has 7 rental boats available for rent during the spring, summer and fall season. Our boats come complete with motor, paddles, lifejackets and safety kits. All of our boats are 14ft aluminum fishing style with bench seating and 9.9 horsepower motors. This combination makes for the best fishing units, due to the short distance that is required to travel, and the motor's ability to troll at the low speeds required for hooking a Walleye. All boats are rented from 7:00 am to 8:00 pm (return time may shorten during the late season). A Pleasure Boat Operator's Card is required by the renter and operator. Prices vary due to the style of the boats and type of motor. See our Rates and Packages page for details. We also have canoes available to rent. Whether you just want to leave your boat for a couple days, the entire season, or have it winterized and left here over winter, County Shores has a complete line of storage packages to suit your needs. Please see our Rates and Packages page for more information.